One of my favorite parts of my garden is the strawberry patch - when we built three new beds last year, we dedicated an entire one to strawberries, and we're not sorry! The strawberries have started to ripen the past few weeks here in Minnesota, and they are so delicious - we have enjoyed several batches of shortcake so far, and of course, this salad! Strawberries and spinach just seem to be made for each other, and the tangy-sweet balsamic vinaigrette, salty cheese, sharp onions, and crunchy almonds take this salad over the top, if you ask me! I hope you are able to find some locally-grown strawberries in your neck of the woods so you can make this salad with a quickness. Enjoy! 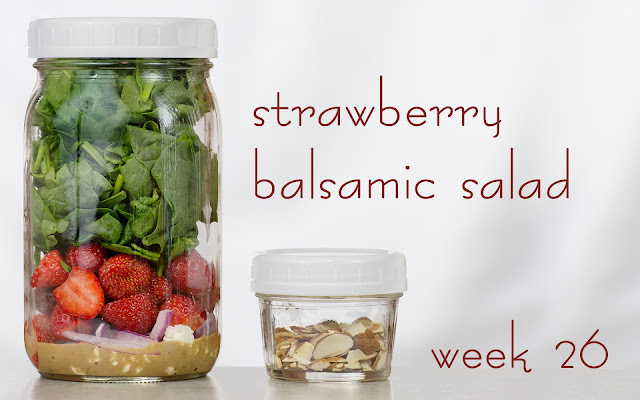 Make the balsamic vinaigrette: combine the mustard, garlic, shallot, sugar, salt, pepper, vinegars, and oils in a pint-sized mason jar or other tall container. Puree and emulsify the dressing using a handheld stick blender. Pack the salads: add 2 tbsp dressing to each of 4 tall quart-sized containers; reserve the remaining dressing for another use. 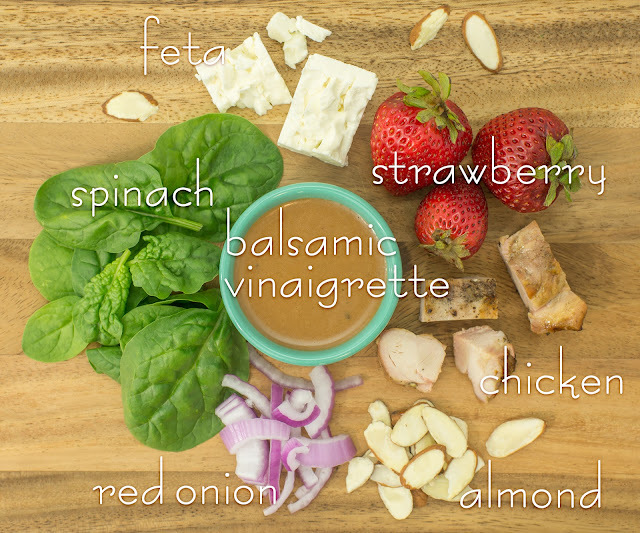 Layer the chicken, feta, red onion, strawberries, and spinach in the jars. 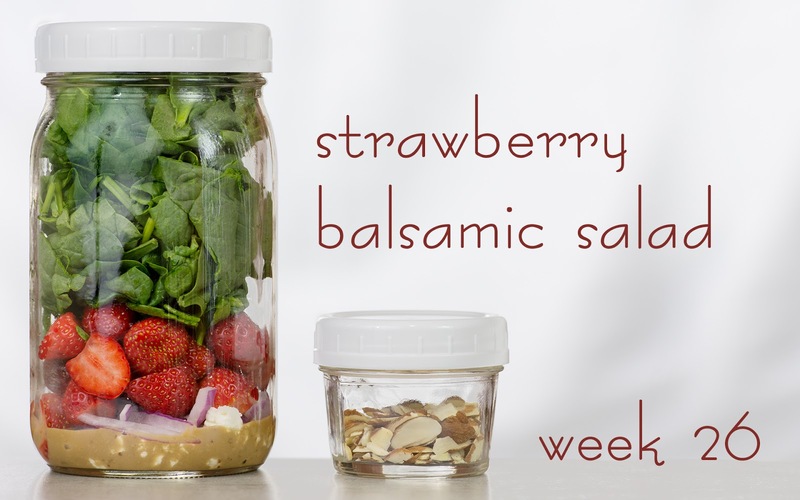 Divide the almonds evenly between 4 2-oz jars or snack-size zip-top bags for each salad. Refrigerate until serving. TIME-SAVING TIPS: Use your favorite store-bought balsamic vinaigrette in place of the homemade dressing. SPECIAL DIET SWAPS: For a vegetarian salad, omit the chicken. For a vegan salad, substitute your favorite vegan feta for the dairy feta. For a nut-free salad, substitute roasted sunflower seeds for the sliced almonds. This salad is gluten-free as-is.